Full brindle, beautiful cow, will eat right from your hand. We're keeping her heifer as replacement. She sells exposed to Bar R Rhinestone Cowboy, an own son of CV Cowboy Casanova. 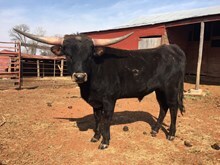 Consigned to the 2019 Cattle Baron's Premium Longhorn sale.